The knee splitter, a terrible torture, was mostly used during the Inquisition. What this instrument accomplished was to permanently render the knees useless. Even though the name implies that this instrument was only used for "splitting" knees, it was also used in other body parts including: the elbows, arms and even the lower legs. As the torturer turned the handle, the claws slowly slammed against each other mutilating any skin in between. 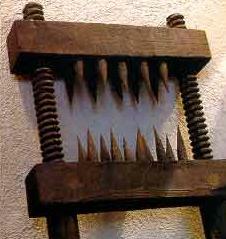 The number of spikes the knee splitter contained varied from three to more than twenty. There were many variants to this instrument. Some claws were heated beforehand to maximize pain - others had dozens of small claws that penetrated the flesh slowly and painfully. Even though this method very seldom provoked direct death, it was often followed by other more painful methods if the victim refused to cooperate.